If breakfast is the most important meal of the day, then lunch is a very close second. Not only does it fill the gap between breakfast and dinner, keeping you fuelled for the rest of the day’s work, it is a chance for workers to socialise and develop friendships and relationships. In this way, lunch is different from the other meals of the day, which are mostly taken at home. Of course, lunch can also be a way to mix business and pleasure. The ‘power’ lunch has been enjoyed by business men for as long as there have been restaurants. Lunch can be a way to reinforce social bonds outside of the work context too. Grabbing a ‘bite to eat’ with a friend is something we all do. Lunching out can be a family affair. Perhaps you are on holiday or maybe you are celebrating a birthday, anniversary or graduation. Going for lunch is a great way to mark the occasion. 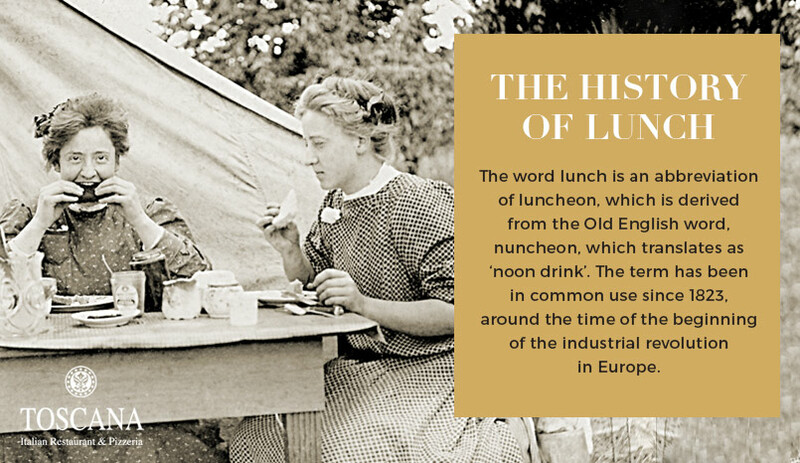 Because Italian food is so traditional, history is important to us at Toscana’s, which is why, before getting to our mouth watering lunch menus, we will give a brief history lesson on the lunch. 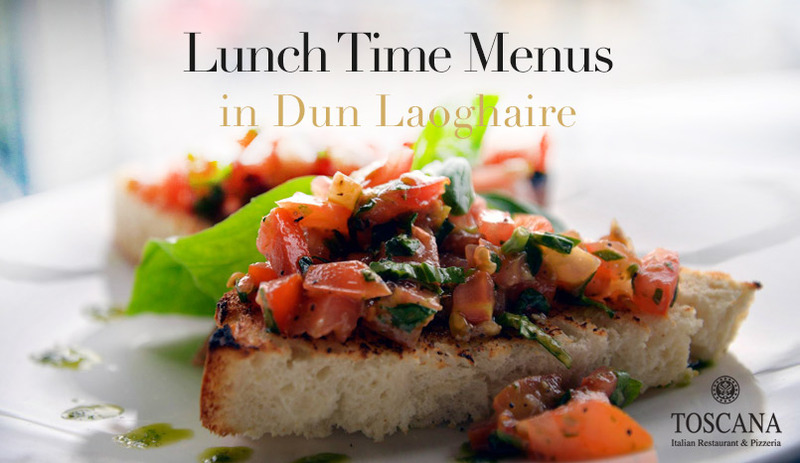 Whatever your reason for lunching, we can guarantee a delightful lunch in Dun Laoghaire with us at Toscana’s. Our lunch menus are second to none in terms of both choice and deliciousness. For light antipasti how about a Bruschetta Rosso Arrostito? This is made from roasted red peppers, sun dried tomatoes topped with goat’s cheese and served with ciabatta bread. Or perhaps our exquisite Spiedino Di Gamberi: fresh Irish prawns skewered with seasonal vegetables and served with cucumber and natural yoghurt. For mains, how about our Polpette di Linguine? A linguine pasta with our authentic meatballs, tomato and fresh basil. Or maybe our excellent Spaghetti Primavera, which consists of spaghetti tossed with fresh green beans, basil pesto and pecorino cheese? 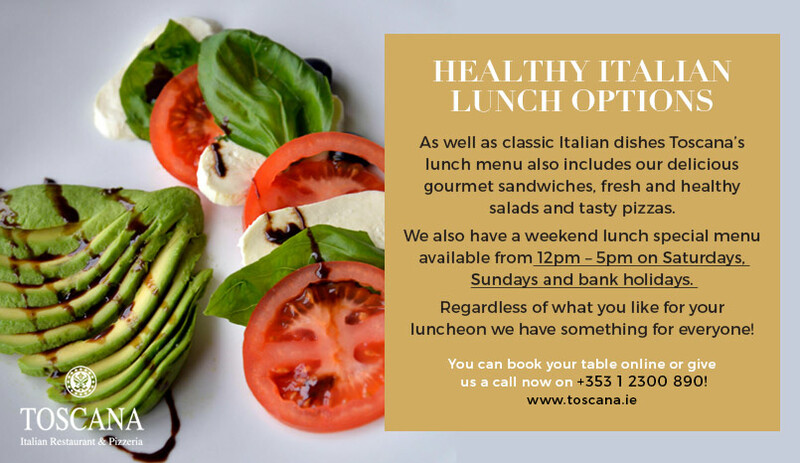 Toscana’s lunch menu also includes our delicious gourmet sandwiches, fresh and healthy salads and tasty pizzas (as well as gluten free options!). We also have a weekend lunch special menu available from 12pm – 5pm on Saturdays, Sundays and bank holidays. Regardless of what you like for your luncheon we have something for everyone and you can book your table online here or give us a call now on +353 1 2300 890!